Icon or eyesore? 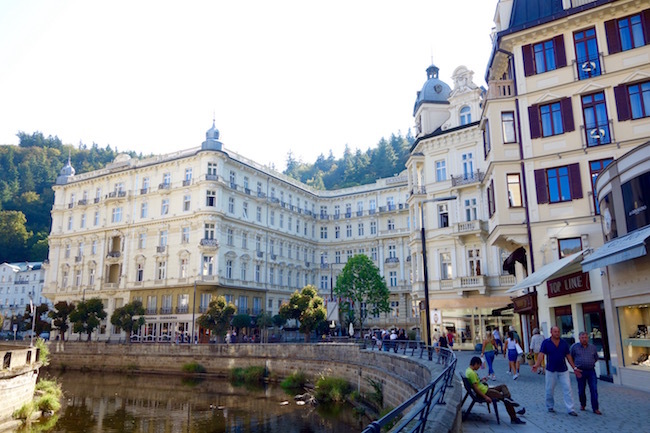 The towering Spa Hotel Thermal in the glamorous Czech spa town of Karlovy Vary stands out, but what many people don’t know about is its fascinating past. Here’s a review of the Spa Hotel Thermal and two other landmark hotels, the Hotel Imperial and the Grandhotel Pupp. 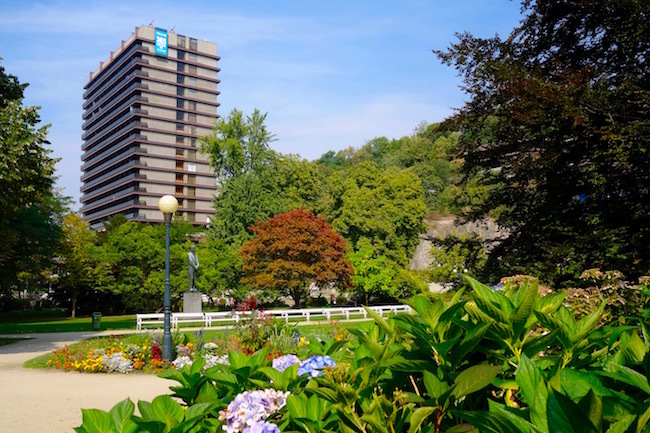 Glancing out the windows of the Spa Hotel Thermal at Dvořák Park and the pedestrian spa zone of Karlovy Vary, I try to broach the subject delicately, not sure how to bring up the fact that the hotel I’m being hosted at, a large block of a building, is, er, no great beauty. Specifically I’m thinking of Rick Steves, who calls it ‘unfortunate.’ Or Rough Guides, which refers to it as a ‘Communist eyesore’. I’m also wondering how I’m going to review the Hotel Thermal. I can’t call it a looker if it’s not. It’s not that the Spa Hotel Thermal is a ‘blot on the landscape’ as one review says. It’s more that its towering exterior stands out in such stark contrast to the delicate pastels and ornate architecture that dominates Karlovy Vary, and gives this famous Czech spa town such a floaty feminine feel. Like a sturdy tree surrounded by wood nymphs, I decide. Taking a bite of my savoury goulash and bacon dumplings I try to think of something positive to say. Since I haven’t even checked in yet, I can’t mention the spa, which is my main reason for visiting Karlovy Vary, a town renowned for its hot mineral springs that gush out from fountains and graceful colonnades all over town. Welcome to Socialist Brutalism, an architectural style that embraces raw concrete, geometric lines and utilitarianism. 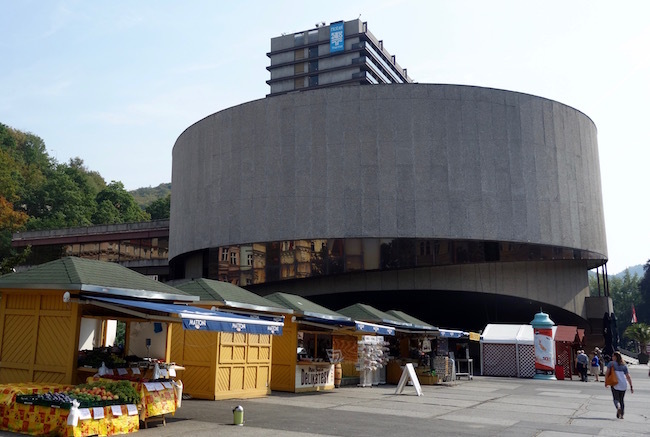 Stern, some say harsh, its seriousness is no doubt intentional, perhaps a reaction against earlier frivolous decorative styles or a reflection of the ‘moral seriousness’ of the the Czech Communist era. Purpose built to host the Karlovy Vary International Film Festival, a prestigious festival that dates back to 1946, the Hotel Thermal was also intended to showcase the modern edge of Czech architecture. 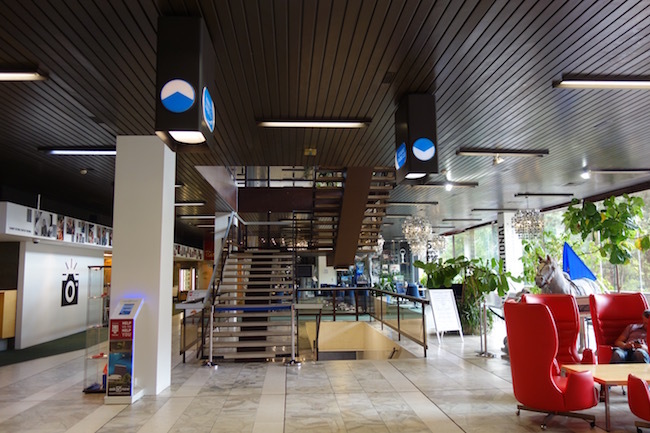 In addition to being a spa hotel, with a large wellness and spa centre spread out over three floors, the Hotel Thermal continues to host the Karlovy Vary Film Festival every July, and it’s one of the rare venues equipped to do so. Its grand Cinema Hall seats 1148 while two more theatres can seat another 1,000. Well, none, now that I think of it. In fact, I don’t know many hotels with theatres in them at all. 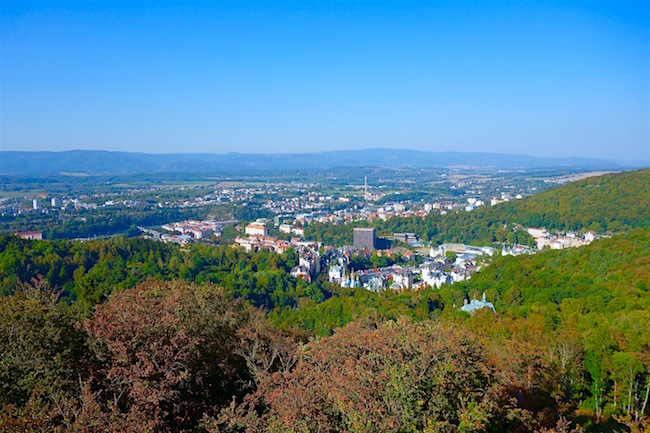 After sampling Karlovy Vary’s famous mineral-rich hot springs in a private bathing cabin at the hotel spa, then taking time out for a swim and a sauna, I head up into the forested hills that rise up over the spa zone. At every different vista, I find myself looking down on the Spa Hotel Thermal. It’s amazing how a little knowledge can change a person’s perception. Now that I’m aware the Spa Hotel Thermal is a landmark example of Socialist Brutalism and not just randomly block-like, I can’t help seeing it differently, as much a symbol of a time and place as the lavish Grandhotel Pupp at the far end of Karlovy’s spa zone or the fairytale-looking Hotel Imperial that blinks down over the town. A major revamp to update the rooms and the lobby of the Spa Hotel Thermal is in the works, but – and I applaud this – the exterior will stay the same. Like it or loathe it, the Spa Hotel Thermal is a part of history and, in a way, a living museum of a now-vanished time. I can’t speak for the guidebooks, but I’ve stopped laughing already. The Spa Hotel Thermal has 273 rooms, 15 floors and offers a number of different spa and wellness packages such as a weight loss program, traditional spa cures, weekend stays and relaxing thermal water spa samplers (the Taste of Thermal Package). Accommodation can also be booked on a B&B basis and treatments can be booked a la carte. There are 3 categories of rooms starting at 52 Euros a night in a Comfort Room in low season (breakfast included) and go up to 205 Euros per night in a Superior Suite in High Season. Package prices vary. The clientele at the Karlovy Vary Spa Hotel Thermal is international. It seems quite popular with people from the United Arab Emirates during summer, especially for its weight loss programs, while in autumn a lot of Germans find their way here for the traditional spa programs that range from 1 to 3 weeks. During the film festival, you’ll find film lovers from everywhere, and at other times of the year, various congresses draw a wide mix of guests. It must have the best views in Karlovy Vary. From my balcony it’s easy to relax and watch the stream of tourists and spa lovers stroll up and down the spa zone promenade. Ask for a park-facing view. The spa. Like most other spa hotels in Karlovy Vary, the Spa Hotel Thermal makes full use of the region’s abundant hot springs. I particularly liked the spa attendant who ran my thermal water bath, then wrapped me up in a sheet and blanket afterwards so that I could relax on a spa bed for a few minutes. The Spa Hotel Thermal has an unbeatable location. Right in the spa zone, you can walk to all of Karlovy Vary’s top sights. 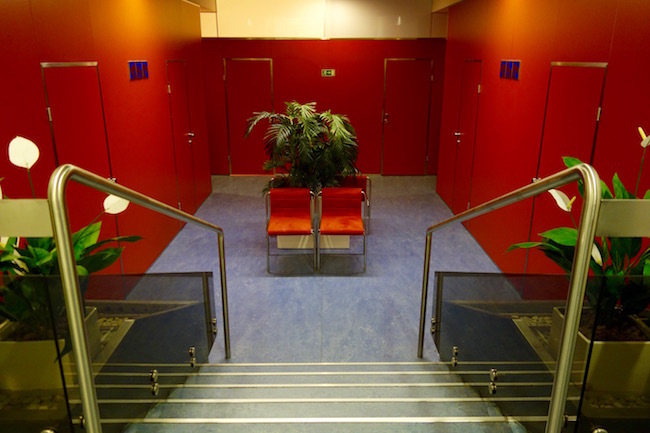 Balneo-Wellness Centre. The hotel has a large pool and sauna facility that’s free to guests. It includes an indoor pool, a regular sauna, an infrared sauna, hot tub, steam room, fitness room and hot and cold Kneipp path (which basically means walking on rocks). At certain times of the year, there is a women’s only access from 1-3 p.m. The Karlovy Vary Film Festival buzz. 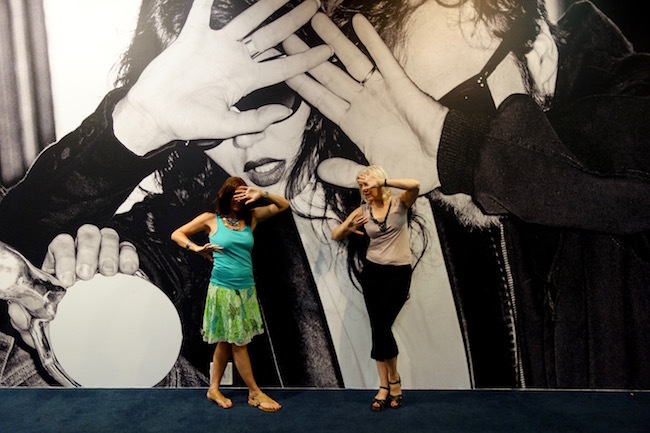 Even when the festival is not on, the film fun continues all year round via oversized photographs and displays. Contact the Spa Hotel Thermal website for more details on spa packages, prices and reservations. The Spa Hotel Thermal isn’t the only landmark hotel in Karlovy Vary. If you prefer to be off the main spa promenade, the Hotel Imperial is a grand Neo-Renaissance hotel that overlooks the spa zone. Built in 1912, the Hotel Imperial has hosted tsars, earls and presidents and offers 4* superior accommodation. 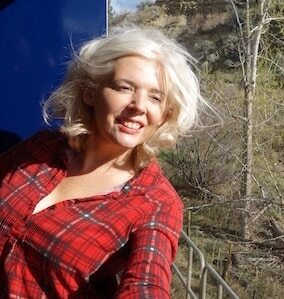 Guests can travel up to the hotel by funicular, car or foot. 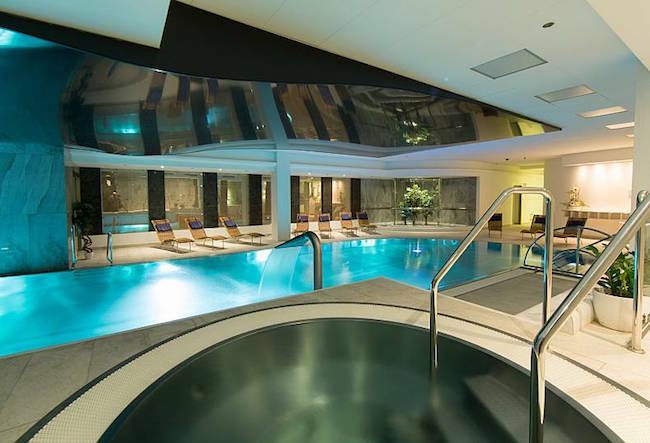 Their Imperial Spa & Wellness Centre offers more than 100 medical wellness treatments, harnessing the power of Karlovy Vary’s therapeutic hot springs for treatments at a tune of some 10,500 litres a day, and their 1600-square-metre spa centre has won a number of awards. Bonus: You don’t need to go down into town to drink the mineral-rich water. Water from the famous Hot Spring (Vřídlo) is piped right into the hotel. The striking Moser glass fountain is one of my favourite design elements of the spa hotel, a splash of modern art that contrasts delightfully with the stately architecture. The Grandhotel Pupp is the most deluxe hotel in Karlovy Vary, and in fact, one of the grandest hotels in the Czech Republic. 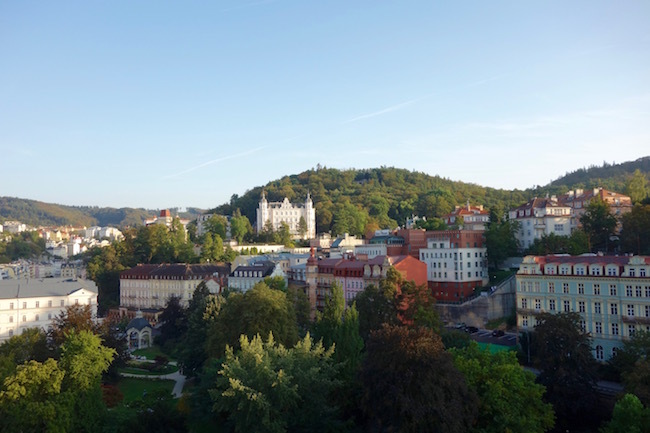 On my first trip to Karlovy Vary I splurged and stayed here, and adored its historic splendour, the hotel’s location at the edge of the spa zone and its proximity to the forest and nature trails. I also loved the Kuwaiti family staying here that practically adopted me and made my stay happily sociable. If the action revolves around the Spa Hotel Thermal during the Karlovy Vary International Film Festival, rest assured, the top stars will be hiding out in the Grandhotel Pupp. Book the Grandhotel Pupp here. Resources: The Czech Tourism Board has a fabulous website with travel stories, travel guides and plenty of tips. 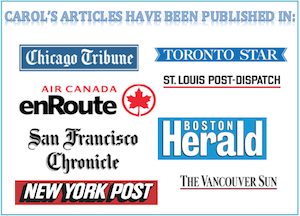 For more info on Europe read Top Destinations in Europe or visit my Europe Travel category page. 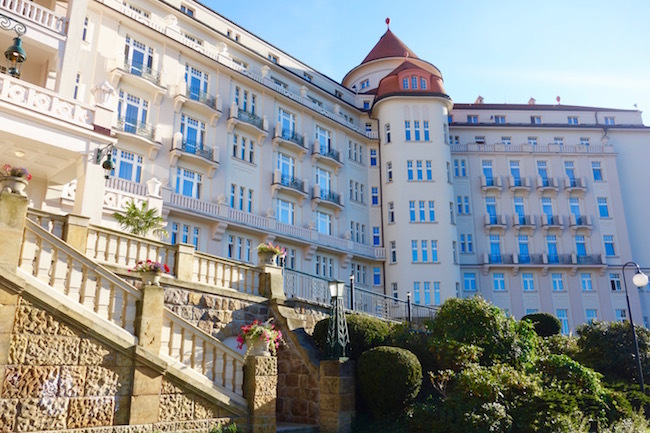 Read more about Bohemia and things to do around Karlovy Vary: The Easy Way to Spa in Marianske Lazne and One Day in Loket: a celebrity hotspot. Disclosure: My trip was subsidized by the Czech Tourism Board. 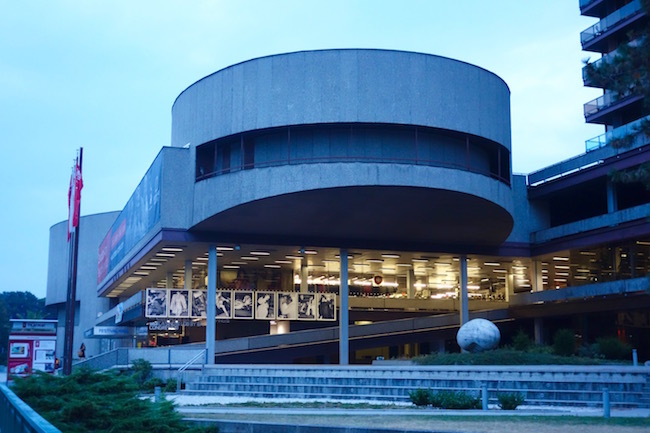 All opinions and new-found fascination with Socialist Brutalism are my own. Ah would love to stay here (mainly because I love a good spa!). Great story behind the place, very interesting to read! I’m surprised that the hotel is popular with the Emiratis, considering the look of the building & the updated room. I guess the spa and the view from the hotel rooms really compensate that “drawbacks”. I quite like the look of the lobby (?) though. Interesting to learn the history of the place. Also, the story behind a building with such a reputation. Gotta love that spa though! I haven’t visited a spa in such a long time. The Karlovy Vary Spa has such an interesting story. Sounds like it is succeeding despite the negative comments about its design. I’d take a room with their great views and spa treatments there anytime. I’ll bookmark it for when we visit. We decided to leave Karlovy Vary for the next trip to Czech Republic and now I feel kind of disappointed I didn’t visit it. The resort looks great with all the abundance of hot spring. This hotel looks like a great choice. Definitely catching the attention from its architecture to the choices it offers. I feel like you offer a really balanced take on this building and how various cities have managed the random communist architecture that grace their skylines. It’s part of a city’s history, for sure, and it’s always good to explore a building like this from the inside out! What a terrific place to visit! I think I would stay here for multiple reasons (I love a good spa), but the views are truly incredible. I love the exterior of the building and I’m glad it’s staying the same!